In my little loom-knitting world, the pattern has become the guide, not the law. Sometimes I have to make little tweaks to make it work for me. And sometimes I just guess. for my sister last year. 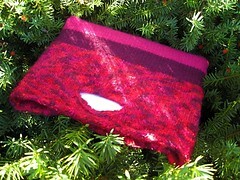 But after felting, it was a very tight fit for a 15-inch laptop. So when I cast on for my own cozy this summer, I made sure to add stitches. The pattern calls for the 41 pegs on the yellow Knifty Knitter loom. I used 61 pegs on the blue Knifty Knitter long loom. I flat knit on the loom, minus one end peg. Since I was going to felt this I didn't worry about the slightly-larger gap between stitches at the opposite end peg on this loom. Now I have a bag that is just the right amount of cozy for my own 15-inch MacBook. Once it's dry, a pink felted pocket will be stitched on the front for the power cord. I might even add a strap someday. Add the white Lion Brand Tiffany fur yarn and knit for 2 inches. Cut the fur yarn and knit for 4 inches. Add the fur yarn back in and knit for 2 inches. Cut the fur yarn and knit for 3 inches. Cast on 8 inches. Garter stitch for 5 inches. 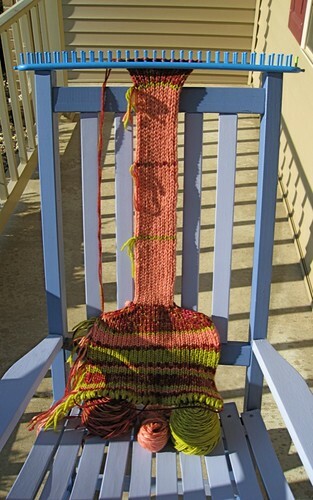 Basic bind off. I sewed the flap onto the purse and into the washer it went. I think the flap felted a teeny tiny bit because it is a little shorter and the stitches are very smooth now. And of course the fur popped up as the main wool felted down. After 3 runs in the front-loader washer and couple days to dry, it was time to finish this lil guy. I hammered on a magnetic snap and sewed on a button. 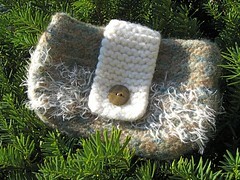 And ta-da, I have a cute little purse for a special someone. I have made a bunch of changes in the pattern and plan to add some pockets, too. My goal is to finish and line this bag before Stitches Midwest on Sept. 11. So stay tuned for my improvisations.